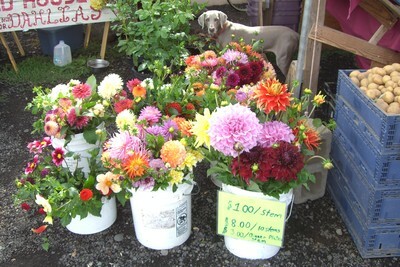 My name is Mark Harvey and I started Old House Dahlias in Portland, Oregon, more than twelve years ago. Using my backyard as a starter plot. When I began planting dahlias, I had just four types. Today, I have more than 200 new and heirloom varieties of dahlias. I offer both tubers to enliven your garden and fresh cut flowers for special events or weddings. I also work with wholesalers. I ship tubers across the U.S. and internationally. I employ sustainable, natural growing methods and packaging. Take a minute to check out my vibrant collection, which comprises stark contrasts in color and size and will add a unique distinctiveness to your garden. And feel free to call me with any questions you might have about starting or maintaining dahlias. From August 10 to frost 2018, I can be found Saturdays and Sundays at Old House Dahlias, now located in Tillamook, OR. You can also find Old House Dahlias' cut flowers at Whole Foods Market Laurelhurst, Fremont, Hollywood Tanasborne, Brdgeport and N.W. Couch St. Greenway as well as at Hawthorne New Seasons, QFC on Burnside, Beaumont Market on Fremont . Please see the Dahlia Varieties page to see what varieties are currently available. When I pull up to Old House Dahlias (www.OldHouseDahlias.com) at 8001 S.E. Mill St., I know I’m in flower land. Pink roses bloom at the entry and brightly colored dahlias fill the city lot to bursting, blooming inside the yard and all along the fence line and curbside. Cars periodically screech to a halt, doors slamming as eager customers stop to buy freshly cut dahlias waiting inside the cooler. Some linger to study rows of dahlias, every plant name spelled out on tall homemade stakes. Owner Mark Harvey will hand you an order form if you want to order dahlia tubers for next summer’s garden. He’ll ship them, or you can save shipping charges by picking them up at the nursery. Slender and tall, Harvey gives me a strong working man’s handshake, then takes me around his property. To me, he looks like a rancher, but actually his day job is at a dairy, convenient for bringing home plenty of year-old cow manure, his favorite fertilizer. Every third year, he adds more manure to the beds, which are slightly raised. Harvey’s dahlias have thick stems and stand upright without any stakes. His secret is pinching back the top leaves when the plants are 18 inches tall, to promote strong branching. Sometimes he chops out the center of the plant to make it sturdier. This is a gardener’s tough love. 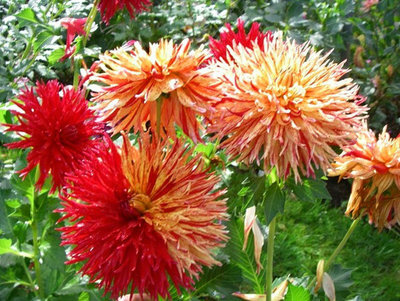 Dahlias need at least six hours of sun to flourish, and more is better. They come in a vast diversity of flower shapes, colors and heights. Harvey grows more than 170 varieties. “I try to have every style of dahlia,” he says, showing me pompoms that remind me of button mums, collarettes that look like pinwheels, humongous dinner plates, and waterlily dahlias that look like, well, waterlilies. We stop in front of “Hollyhills Spiderwoman,” one of his favorites. We pause to admire “Urchin,” a dark red dahlia with laciniated petals and narrow leaves, that resembles a sea urchin, only softer in texture. Entirely different, “Maki” is a huge pink dahlia with purple stripes — it looks good enough to eat for dessert. I wonder why a huge yellow flower with red streaks is named “English Breakfast,” but maybe it suggests the British combo of scrambled eggs and broiled tomatoes. “For cutting, stay away from dahlias with open centers and dinner plates with long petals,” Harvey advises. Of course, open centered ones are more accessible to the bees, and long-petaled dinner plates are flamboyantly gorgeous out in the garden. For longer lasting bouquets, Harvey recommends cutting dahlias early in the morning before the day’s heat pulls the moisture out of the flowers. “Keep them in a cool part of the house, change the water daily, and recut the stems,” he advises. Some years dahlias will winter over in the ground, but wet, cold winters are hard on them, especially in clay soil. As a grower, Harvey has become expert on digging them at the season’s end and storing them for spring shipping. There are many techniques for this process, but the key is to remember a few guidelines. “Store them in a dark, cool place, but not moist, and not exposed to cold,” he says. First lift the tubers, clean them, and let them dry thoroughly. Then, you can store them in a cardboard box with newspaper on the bottom. Stack the dry dahlias, put newspaper and some moist peat moss on the top. “Or poke holes in a plastic bag, stack the tubers inside, put a little peat moss on top, and leave the bag open,” Harvey says. Even easier, cut the stalks back on the dahlias, leaving a short piece of stalk as a handle, then stack them in a bucket, and stuff newspaper on top. In the spring, when you see the “eyes” coming out on the tubers, it will be easier to divide them.